Ever felt like your personal values are at odds with your company's bottom line? Or maybe you just want to start off on the right foot. 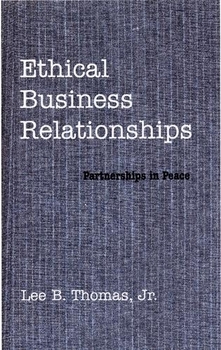 Ethical Business Relationships examines a range of topics relevant to successfully managing a business enterprise in today's complex, difficult environment. As businesses come to play a significant role in shaping the global landscape, business decisions raise important social, financial and moral questions for each of us as individuals and for society as a whole. Here, author Lee Thomas suggests that we need to establish and uphold a set of ethical values to drive the way we manage our businesses, and outlines the important role the business community should play in improving economic and social conditions both locally and globally. To encourage careful thought, he includes specific, critical examples from his own career at several large, successful companies to clearly highlight the importance and benefit of doing business the "right way". Lee B. Thomas, Jr. served as president and CEO of Vermont American Corporation from 1962 to 1984 and was chair of the board from 1984 to 1989. He is currently chair of Universal Woods Inc. and executive in residence in the School of Business at Bellarmine University in Louisville, KY. He served on the board of the Council on Economic Priorities in New York City for more than 30 years until 2000, and was chair at the time it negotiated the SA8000 universal workplace standards for global business in Geneva, Switzerland, in 1997. He has served for many years on the Louisville Council on Foreign Relations, and is also on the board and finance committee of the Better Business Bureau that serves Kentucky and Southern Indiana. Thomas is also a founding member of Louisville (Kentucky) Friends Meeting, which celebrated its 50th anniversary in May 2004.